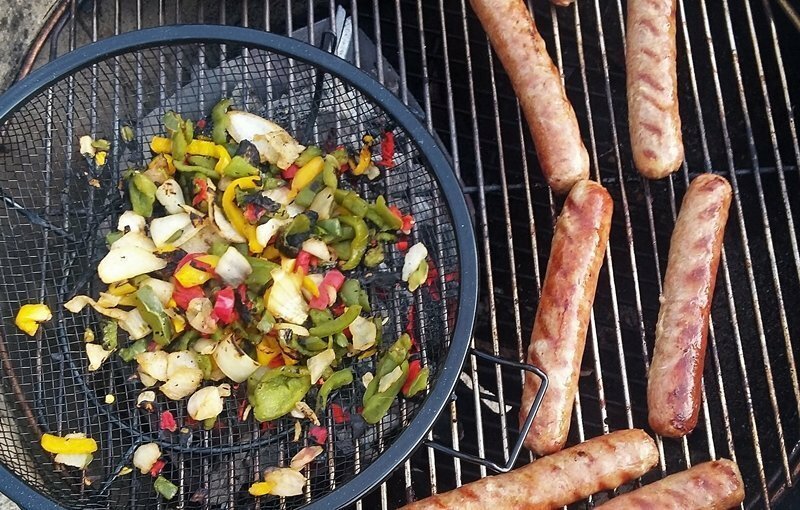 To make our Italian sausages on the grill we will be grilling everything we need. This will require an arsenal of grilling gadgets. 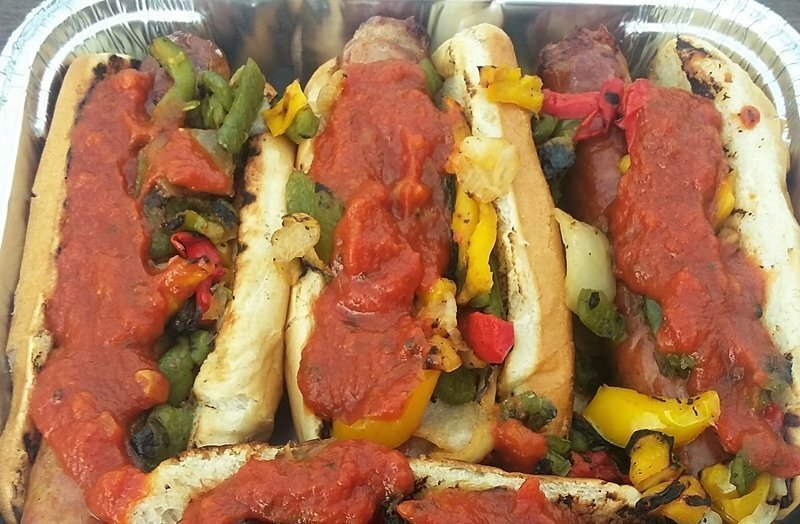 Our Italian sausages will be served on buns toasted with garlic butter and served with grilled peppers onions and pasta sauce. There is no prep to speak of but the grilling itself is labor intensive. The end result will be a restaurant quality Italian sausage sandwich. 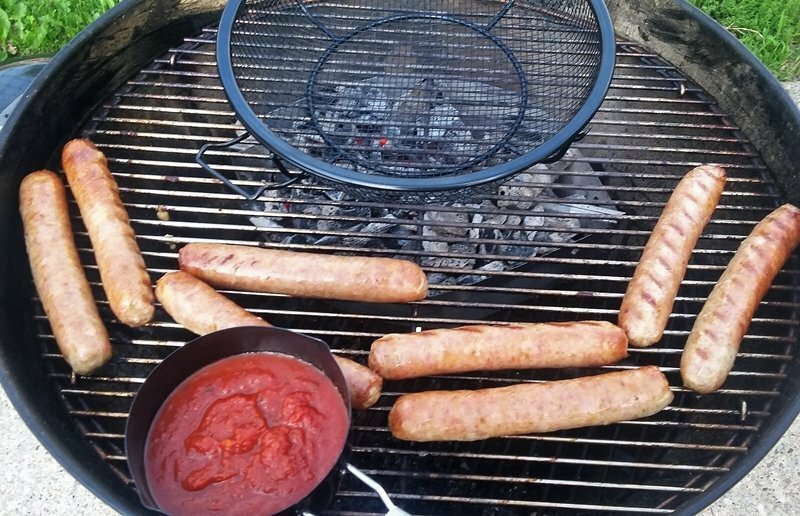 As easy as Italian sausages on the grill sounds the process we are taking you through here requires a high skill set. You will be tending to 3 different things at the same time on the grill. If you think it is too much for you pre make the peppers, onions and sauce in the kitchen first. If I haven’t scared you off yet, let’s get into Italian sausages on the grill. The large grilling wok is 12 x 12 inches wide and has slanted 2.5 inch deep sides that will help keep your food on the bottom to absorb all the great grilled flavors. We have chosen to use the DiRusso’s Italian sausages. 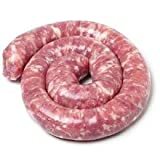 They are a good quality uncured sausage with a great flavor. They come frozen and the grilling instructions on the back of the package say to grill them for 25 to 30 minutes over a medium heat. We will be grilling over charcoal on our trusty Weber Kettle set up with 2 heat zones. The direct heat is set up to be a high to medium high heat, this is for grilling our peppers and onions. Once our grill is heated, we place the DiRusso’s Italian sausages over the no heat section of our grill and close the lid for 15 minutes. After 15 minutes we turn and rotate the sausages and set the lid of our grill aside. From here on out we will no longer be covering it. We place our wire mesh grilling skillet directly over the hot coals to allow it to get hot. We pour our pasta sauce (Ragu Roasted Garlic) into a small sauce pot. Place it onto the grill away from the heat. This needs to be stirred every few minutes while you roast your peppers. Once our skillet is hot we dump our bag of frozen peppers and onions into it. Fresh will grill up better and provide a bolder flavor but we want this to be as easy possible. Let the peppers sit for a minute or two and stir. Repeat until you see some char developing on the vegetables. This process may take 10 to 15 minutes. If you are using frozen there will be a point where you see all the water leaving the peppers and onions. Do not worry it’s not going to turn into soup, just keep going in a few minutes the char will begin to develop. Once the peppers are charred to your liking remove them from the grill and cover to keep warm. Move your sauce pot with you pasta sauce close to the heat and continue to stir every few minutes. 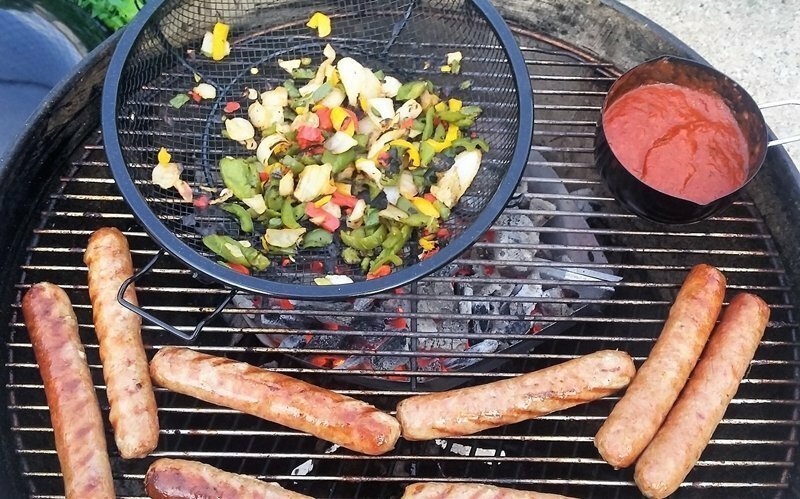 By now your sausages should be fully cooked, you can remove them from the grill or push them to the coolest part of the grill to keep them warm. Take 2 heaping spoonful’s of minced garlic and a quarter of a stick of butter. Place into a sauce pan over the heat stirring frequently. Until the butter is at a boil and there is garlic in the air. Then move it to the cool side of the grill. 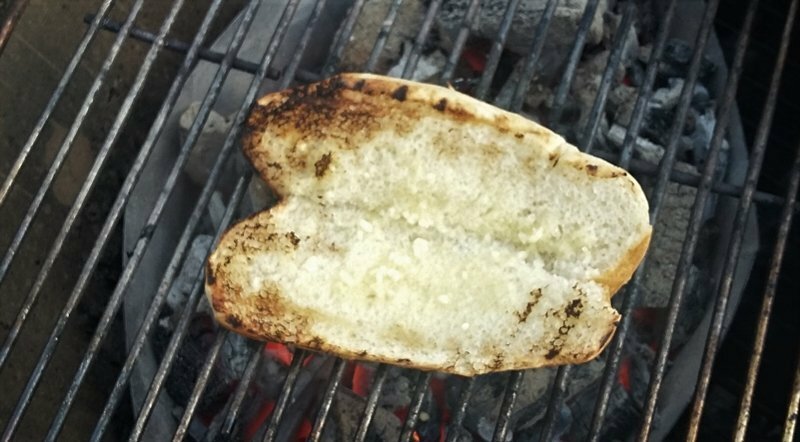 Open your buns and coat the inside with garlic butter then place face down on the grill over the heat. Then coat the back of the bun with garlic butter. Depending on how hot your grill is your buns can be fully toasted in 30 seconds or 2 minutes. So check the first one frequently. Repeat this step for all of your buns. 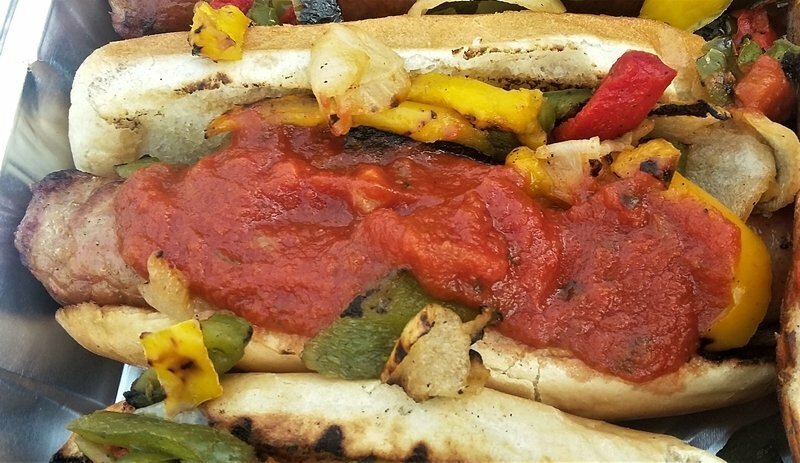 Assemble and enjoy your grilled Italian sausage sandwiches.